On occasion, as head of a community Jewish private school, I have been asked to sit in on the school’s scholarship committee meetings. Children of divorced parents often present complicated scenarios for the committee to ponder. For example, one parent may value Jewish day school education and the other may not. Moreover, a divorced mother may want her son enrolled in a Jewish day school not because of the education offered there, but because she wants her son to have role models. A father may think that the education at the day school is too parochial, not affording his child a wide range of course offerings. Such opposite points of view are not lost on the child, who may want to please both parents but feels inwardly conflicted. Then there is the question of day school tuition. Who is responsible? Mom or Dad? And what if the mother has custody, but limited financial resources, and what if the father has little interest in Jewish education, but has the economic wherewithal to pay tuition? While sensitive to the financial challenges the committee faces, my rabbinic training invariably compels me to see things from the child’s perspective. What is in his best interest? Divorce creates dysfunction within the family at many levels, and the child is riding an emotional roller coaster. Most important to me is focusing on creating a stable, predictable environment so that the child can grow academically and emotionally. 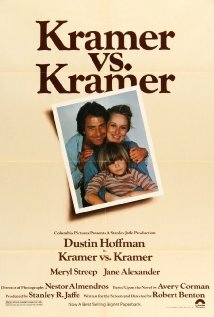 As I watched Kramer vs. Kramer, a thoughtful film chronicling the disintegration of the marriage of Ted and Joanna Kramer, I recognized the epiphany to which the Kramers ultimately arrive. Ted Kramer is a high-powered advertising executive who spends little time at home with his wife and child. So neglected is she that she decides to leave him and their son Billy as well. Suddenly, Ted is a Mr. Mom with full responsibility for Billy. This puts enormous strain on Ted who is in the middle of closing a major business deal. Billy is a little boy that requires attention and, at first, father and son do not have an easy rapport, each one resenting the other. Ted, for the first time, has to learn to think about others, and not just be concerned about his clients. Over several months, they begin to relate positively with one another and love grows as they both begin to enjoy the other’s presence. Fifteen months later, Joanna returns to New York to claim Billy in a custody hearing. What emerges from the proceedings are character assassinations of both parents, no longer in love, but who love Billy and want to do the best for him. There is a story about King Solomon that is instructive. Two mothers come to him. They both had given birth but only one son survived. Each mother claimed the son was hers, so Solomon commanded that the baby be cut in two and each mother would receive half. One mother said this was fair; the other said let the other mother have the child rather than kill it. Solomon awarded custody of the child to the mother who did not want the child split fifty-fifty. What trumped everything was what was in the best interests of the child. Personal desires, personal egos, have to be left at the door lest the child be emotionally chopped to pieces. Ted and Joanna Kramer start their custody battle as adversaries, but gradually understand that Billy needs the love and presence of both parents. The love for parents for one another may be conditional, but love for their children is not.